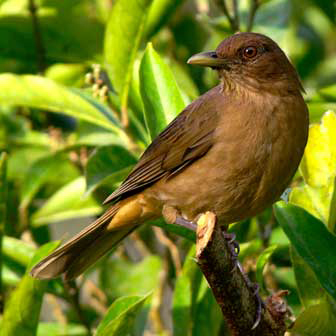 This is Costa Rica's national bird. No joke here, just always thought it was a surprising choice on their part. 00:00:00 - Ryan is joined by J. Leighton Reid to talk about birds, forests, and conservation. The first paper discussed is about how forest restoration in the tropics benefits birds. 00:24:34 - Speaking of feeling restored, how about beer? Leighton pulls off something that few guests or even co-hosts have ever accomplished: he has a beer Ryan hasn't heard of, namely a Alphadelic IPA by Hop Valley Brewing Company. Ryan also has a beer hailing from Oregon, a Class of '88 Belgian Style Ale from Deschutes Brewery et al. 00:26:05 - Next up we cover this new technique of applied nucleation, where you plant small patches of trees instead of trying to replant the whole forest. Fewer trees but better results? Talk about a win-win! If you want to know more about the project, you can read about it here and if you'd like to donate directly, you can do so here! 00:55:38 - PaleoPOWs are a lot like forest restoration, we're not quite sure how its done but we're really hoping it works out. Since Ryan is flying is solo this week there's only one entry to be had, but it's a good one. Clifford E. has started a recurring donation, which is hugely awesome for us and for you because it makes the show that much better, so thanks, Cliff! We're also excited to announce that we'll performing a live show in San Francisco as part of the 2014 Bay Area Science Festival in conjunction with the Nerd Nite Block Party. Check the link for details and please stop by if you can! Last up, we're trying to give some games away to donors, if you would like the really cool Indie puzzle game The Bridge and have ever donated to the show, e-mail Ryan for your free copy!